Back in November, I posted for the first time about Liebig's colorful and abundant trade card sets, which were produced for more than a century, from the 1870s through 1970s. More than 11,000 unique cards were published and most were issued in multiple languages. They came in themed sets (or series) of 6 or 12 cards. One great place to start for more information about the cards is the Cartolino website. 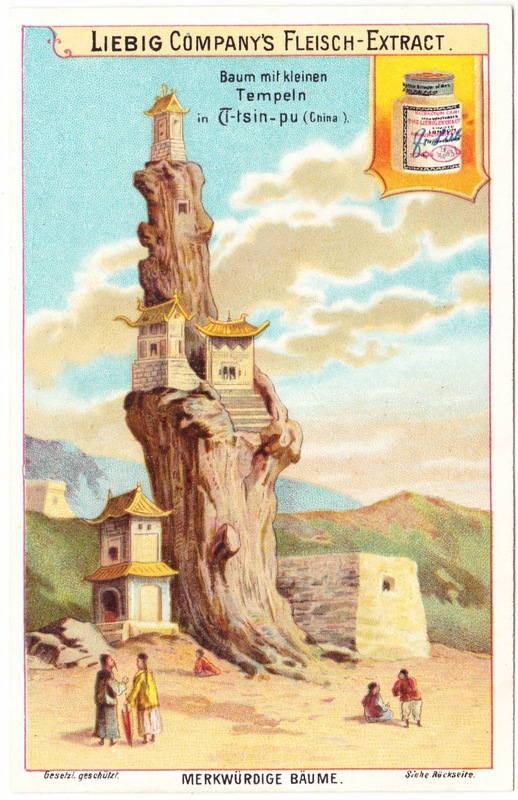 One set, which I believe included six cards, was titled Strange Trees1 (Merkwürdige Bäume in German). I have four of those cards and will be featuring two today and two later this week (hopefully tomorrow). 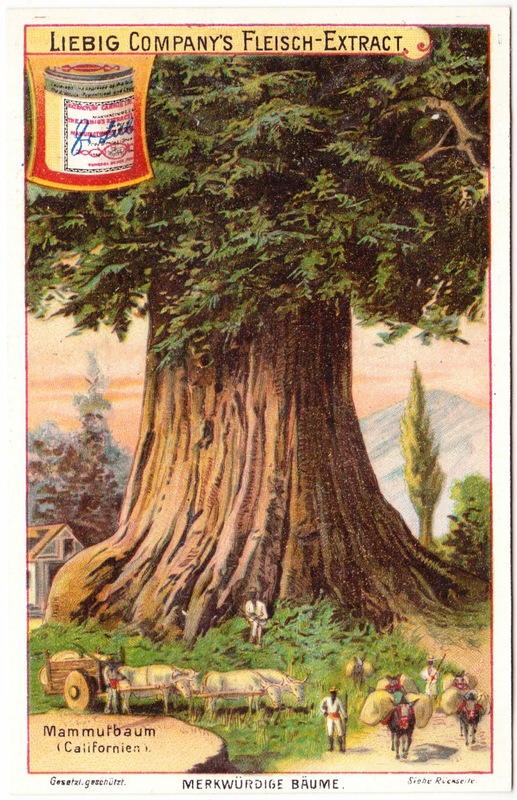 First up is this card featuring Mammutbaum, also known as Sequoiadendron giganteum, and best known to us as the towering giant sequoias of California. The second card is a beautiful mystery. It appears to be a religious structure built within a huge, dead tree. Baum mit kleinen Tempeln translates to "tree with small temples." But I can't find much more about where this amazing edifice is or if it still exists. The only other lead I have at the moment is that the image of the "treehouse" also appears in Globus: illustrierte Zeitschrift für Länder- und Völkerkunde (illustrated magazine for country and Ethnology), a German-language publication from the 1880s. 1. Other Liebig sets of strange things included Strange Insects, Strange Feminine Hairstyles, Strange Dwellings and Strange Mammals.